Cancun in Mexico is a popular destination for tourists all year round due to its sunny climate, white sand beaches and stunning clear waters. Those planning on taking a romantic vacation in Cancun will be spoilt for choice in terms of activities and sights to visit. Here are a few ideas for that perfect romantic vacation in Mexico’s number one coastal destination, Cancun. The beaches of Cancun are quite possibly the reason most tourists pick this town in Mexico to visit, especially those who are looking for a relaxing and romantic break. For those that enjoy swimming then Playa Langosta is the perfect place to dive into the turquoise water, many people say this is the best beach for swimming in Cancun. Playa Delfines is one of the most popular beaches in Cancun due to its sandy shores, stunning views and peaceful sunbathing. Those who are tempted by the tug of adventure can enjoy water-sports such as para-sailing and water-skiing in Playa Chac Mool, which also has many local restaurants nearby. If you and your partner want to immerse yourself in some history mixed with breathtaking sights then you simply must visit the Coba Ruins. These ruins are all of what is left of one of the largest Mayan cities and a stunning sight to behold. Enjoy climbing up the largest temple in Coba, or rent a bike and go on a romantic cycle through the dense jungle to visit each of the ruins. This historical sight is around 2 ½ hours away from Cancun, however they really must be seen, so hire a car to visit this beautiful part of Mexican history. After a hard day of climbing Mayan temples what better way to relax then with a facial, massage, or even lots of little fish ex foliating your skin? There are several spas in the Cancun area, one of the most popular being the Fish Spa which uses Garra Rufa fish to gently remove dead skin and provide a therapeutic, if very ticklish, experience! Put your feet up and enjoy some romantic pampering before your next big adventure in Cancun. There is nothing more romantic to do in Cancun than fulfilling one of everybody’s life dreams; to swim with dolphins. 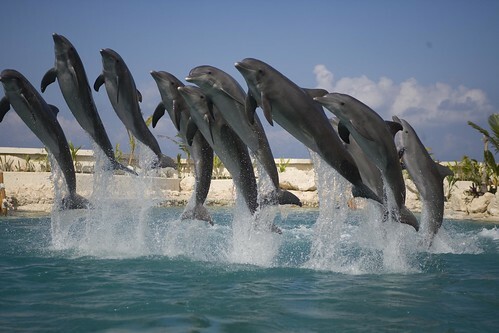 At the Dolphinaris Cancun you can do just that, as well as watch some world-famous shows performed by these beautiful creatures. If you only do one thing whilst on your romantic vacation in Cancun, Mexico, it has to be to visit the Dolphinaris and swim with the dolphins. To make sure your romantic vacation in Cancun ends with a bang, you must take part in a Cuncrawl (or Playacrawl) around the bars and nightclubs that are so popular in this Mexican coastal town. These fun guided tours will take you to all of the biggest and best places to be all night, all of your drinks and cover fees are included as well, meaning you and your partner can relax and go with the flow! Just make sure you do not participate in this the night before your flight home, as you may be feeling slightly worse for wear in the morning. 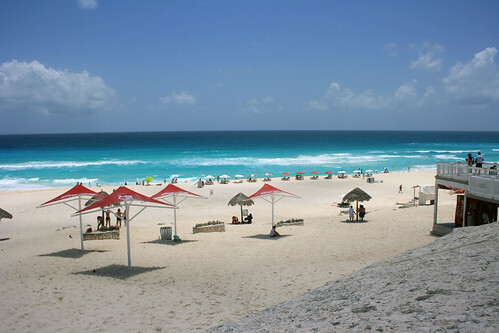 Cancun in Mexico has it all; stunning sandy beaches, Mayan ruins and relaxing spas. Make sure that on your romantic vacation to this beautiful coastal town you take the time out to swim with dolphins as it will certainly feel like a dream come true. If you need car hire whilst in Cancun, visit the Car Hire Direct Comparison Service for a range of rental options. Last, but by no means least, go on a fun-filled crawl around all the most popular bars and night clubs that Cancun has to offer. Whatever you decide to do on your romantic holiday here, you can be sure it will be one to remember.